This championship is the fourth competition in this row, which started on the 3rd of February with eight teams comprising three members each, competing against each other on a knock-out basis to make it to the final round. The duel of words was thoroughly enjoyed by the spectators as the champs won over the rest of the participating teams through the first round, the semi-final round and the final round as well. The concluding ceremony was presided over by Professor A G M Shahidullah, Principal, Radiant School and College. The chief guest, Mr. Abul Momen, Resident Editor, The Daily Prothom Alo, reminded the audience about the necessity of debate. He explained, debate should not be only an extra curricular activity at academy, but should also be practiced in daily life. Special guest of the event was Mr. Prashanta Bhushan Barua, Head of Laws, London Trinity College, who presided over the debate. The ceremony turned auspicious with the presence of the guests of honour, Mr. Shahidul Islam Bachchu, Bureau Chief, The Daily Star, Mr. Masud Bakul, President, Drishty Chittagong, Mr. Rashedul Amin Rashed, Vice President, Drishty Chittagong, and Mr. Saif Chowdhury, General Secretary, Drishty Chittagong. The debate took place between the teams 'General Ataul Gani Osmani' and 'Birshreshto Matiur Rahman' on the topic 'Our past is glorious than that of our present.' 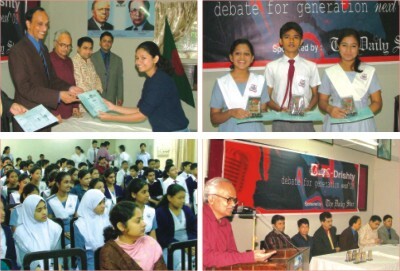 The debate was won by the favouring team on a very narrow margin under the judgement of Mr. Syed Rifat Faruk, Executive Member, Drishty Chittagong, Ms. Subarna Chowdhury and Ms. Sanjana Rahman, Senior teachers, Radiant School and College. The event was co-ordinated under the supervision of Saber Shah, Saifuddin Munna, Reza Chowdhury, Masudur Rahman Members, Drishty Chittagong, and Afsana Rahman Toma, Secretariat Member, Drishty Chittagong. 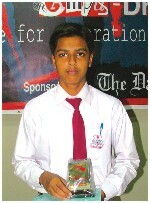 Class X: Abdullah Mustakim Nasif, Ridwan Haider, Azmayeen Mohammed Kamal, Noshin Nawar Sadat. Priyom Shamudra, Mohiuddin Ekram. Class IX: Rafay Bin Shah, Sarah Asefa Zaman, Shams Tabrez, Muntaha Iqbal, Abrar Hasan, Ritwik Roy. Class VIII: Debarati Barua, Mainuddin Imon, Afsana Iffat Khan, Zarin Tasnim Maisha, Nazifa Muniyat Quader, Wasi Sadman. Class VII: Syed Salvi Tasnia Durdana, Arifa Rashid Chowdhury, Samiha Sohel, Imon Shahriar, Shadman Kaiser.